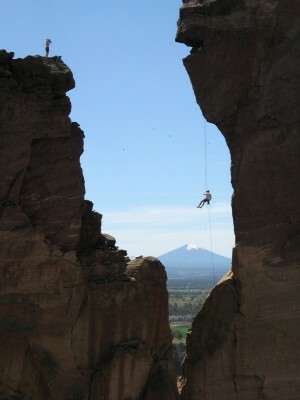 Return To Smith Rock is the sequel to the 2006 Climbing Adventures of Joel Meyers, Sean Smith, and Scott Marlow. The 2008 cast makes their base at Skull Hollow Campground, just a few miles north of the State Park. Marlow headlines this second tour with all new team members from The Mountaineers Crag Course: Dan Azer, Jeff Meyers, and Adriana Moscatelli. Instructors include: Mark Candelaria, Julie Morris, and Kevin Piasecki. Photographed against Smith Rock’s idyllic 600+ acre sport-route paradise, students test their trad(itional) climbing skills in stifling triple-digit temperatures against ominous cliffs – like the famous Dihedrals, Red Wall, and the West Side’s Spiderman Buttress. Out of Harm’s Way, Moscow is visited, and SuperSlabs of huckleberry ice cream and Cinnamon Toast are consumed. Noone is hurt. Everyone comes home safe. Phone calls are returned Tuesday, May 20.